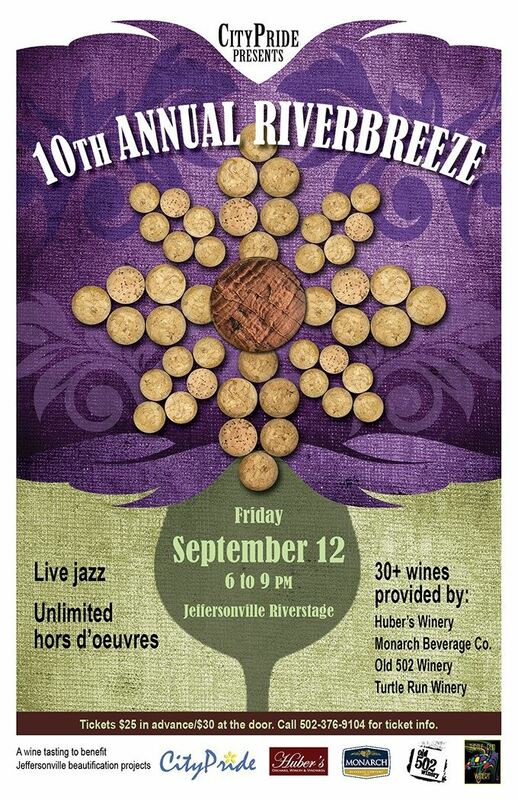 City Pride Presents the 10th Annual Riverbreeze Wine Tasting Festival Sept. 12 from 6 to 9 pm at the Jeffersonville Riverstage. It is strictly to benefit City Pride’s beautification efforts in Jeffersonville and is City Pride’s only annual fund-raiser. There will be lots of wines, unlimited hors d’oeuvres and live music. Join us for 30+ wines provided by Huber’s Winery, Monarch Beverage Co., Old 502 Winery and Turtle Run Winery. Tickets are $25.00 in advance, $30.00 at the door and can be obtained from the Mayor’s Office (812-285-6400), Office Supply (812-283-5523) and Choices (812-283-6008), both in downtown Jeffersonville, or from a City Pride Volunteer. For more information, visit Jeffersonville City Pride Facebook.